It was not very long time ago that us humans moved from cooking food on open fire to using gas, electricity, and other modern means of cooking. Also, it has not been very long since we started living in concrete houses with secured roofs and other comforts for resting. While exploring the wilderness you will come across many such instances where your core strengths will be tested. Imagine being in the outdoors without your bed, your kitchen equipment, etc. That is where you need to safe guard yourself from the outdoor elements and keep yourself prepared. Learning the tips and tricks of survival is a fun task and if well implemented they can save you from the worst. Life in the wilds may seem harsh, maybe even impossible, but not so long ago our beds, shelter, food and water came from the wilds itself. The knowledge is still within all of us, though it’s well buried and not always available when we need it. Camping out in colder conditions is always a challenge but going without a tent, sleeping bag and stove requires a real understanding of survival priorities and a good knowledge of how to provide these essentials for life, using what nature provides. 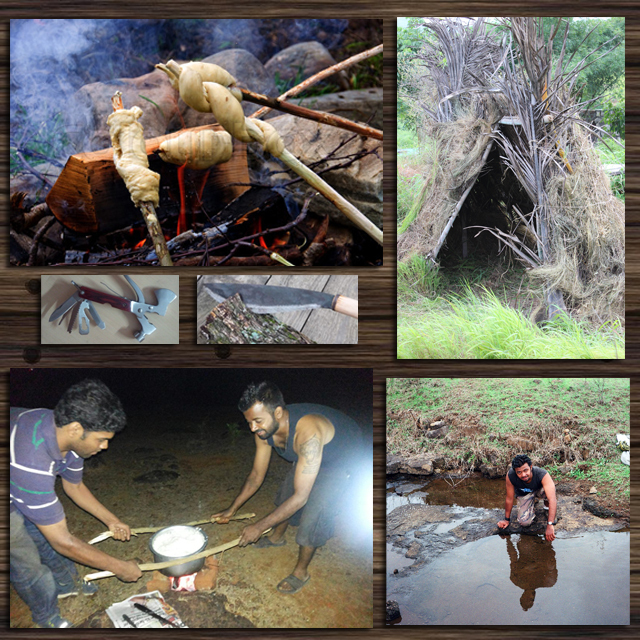 At Rivers and Ridges we practice bush-craft in its rawest form, which is using a bow drill to start a fire, shelter building, cooking on an open fire, locating a water source and making it safe to drink, carving a spoon out of wood, using cutting tools safely and keeping them sharp, and many such activities that require primitive technology. All of this is possible if have an intense desire to learn everything there is to know about self-reliance in the wilds.